The role of universities in controlling the use and abuse of "study drugs" — prescription drugs used to increase concentration or mental stamina — will be the focus of a campus-wide debate and public forum. 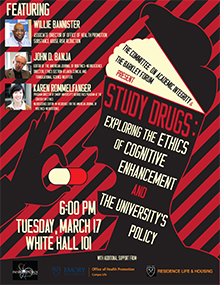 "Study Drugs: Exploring the Ethics of Cognitive Enhancements and the University's Policy" will allow the campus community to examine the ethics of the unprescribed use of study drugs, university policy and issues of academic integrity on Tuesday, March 17, at 6 p.m. in White Hall, room 101. The free forum will open with a 20-minute debate featuring four Emory students who will address what the university's response should be concerning the regulation of study drugs. "Then we'll open the conversation to the larger audience to ask questions, deliver speeches and respond," says Ed Lee, director of debate for the Barkley Forum, Emory's award-winning debate team, which is assisting with the event. Karen Rommelfanger, program director of Emory's neuroethics program at the Center for Ethics and neuroscience editor-in-residence for The American Journal of Bioethics-Neuroscience. Co-sponsored by the Committee on Academic Integrity and the Barkley Forum, the program aims to serve dual purposes: to foster civil discourse around difficult topics and to allow the campus community to join in discussions on a subject that is not explicitly addressed as an academic integrity issue within Emory College's Honor Code, says Jason Ciejka, associate director of the College's Honor Council. "It's a complicated topic, but also an emerging discussion," says Ciejka, who notes that each school and unit at Emory has its own honor code. "The purpose of the event is not necessarily about making this a policy, but we think it would be interesting for students, faculty and administrators to think about this problem," he adds. "It's a conversation worth having and important for students to see the risks involved with abusing prescription drugs." The idea for creating a public forum around the topic emerged from a desire to establish a signature event that could be continued annually, according to a spokesperson for the College Honor Council's Committee on Academic Integrity. The forum is presented with support from the Emory Neuroethics Program, Campus Life's Office of Health Promotion, and Residence Life and Housing.